Although you can use iTunes and iCloud service to backup data on your iOS devices, iOS data recovery issue is still one of the hottest topics among iOS users. iOS Data Recovery software is the final answer of the problem of how to recover data from iOS devices. 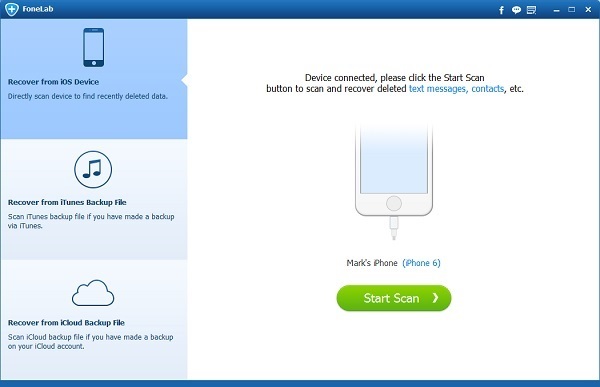 This iOS recovery tool can scan your iOS devices deeply and find the deleted data easily. You can select and recover data from iOS devices to computer as you want. It is now the best solution of iOS data recovery problem. It supports iPhone, iPad and iPod touch perfectly. You can even recover data from devices running the latest iOS 10. Now follow this guide to recover data from iOS devices easily. Free download, install and run this iOS Data Recovery on computer. Connect your device to computer via USB cable. The software will recognize your iOS device and load it to its interface. You can see the basic information of your iOS device easily. Click “Scan” button, the software will begin to scan your iOS device deeply to find the deleted data on it. This process will be longer if you have much data on your iPhone. Please wait patiently. After scanning, this iOS recovery tool will list all your iOS data on the interface. You can find and preview the data you want to recover easily. After scanning, you will see a data menu on the left side of the interface. Here lists all the data you can recover from iOS device. Enter each category and you can find all the data you want recover them. You can recover text messages, photos, videos, contacts, notes, reminders, calendars, voice memos, voicemail, Whatsapp messages, iMessages and other data from your iOS devices easily. Run this iOS Data Recovery on your computer. Select “Recover from iTunes Backup File” option on the main interface. You will see all the iTunes backup files on your computer. 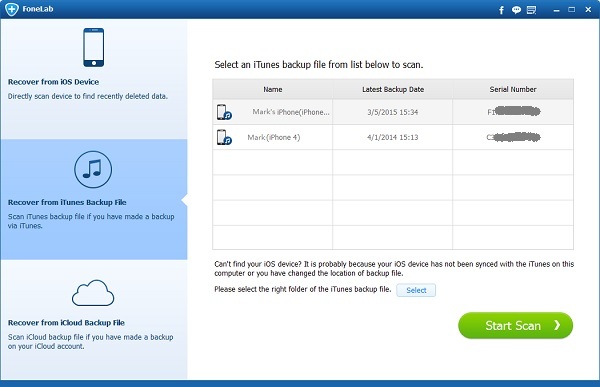 If you change the location of your iTunes backup file, you can easily find it manually. 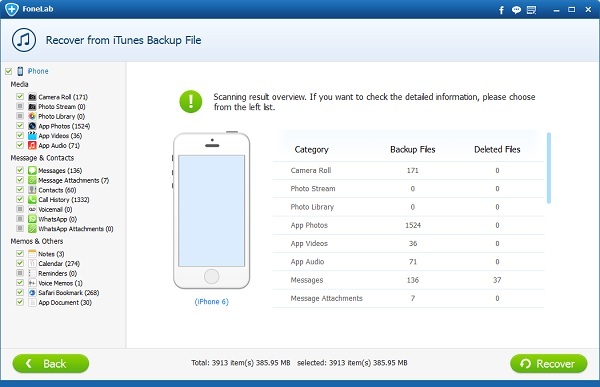 Find the iTunes backup file you want to recover data for your iOS device and click “Scan” button. 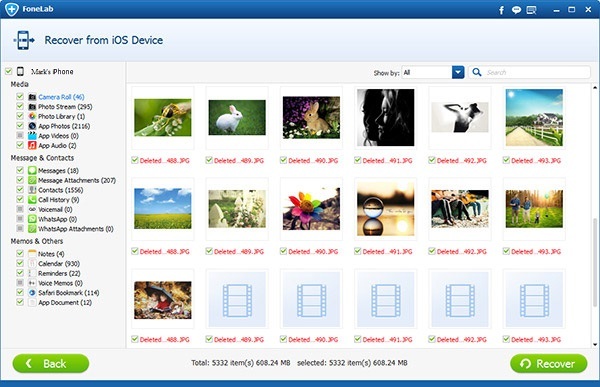 The software will easily scan your iTunes backup file and list all the data on the interface after scanning. What you need to do is just select and preview the data you want. From the data menu on the left side of the interface, you can find all the data in your iTunes backup file and preview them. 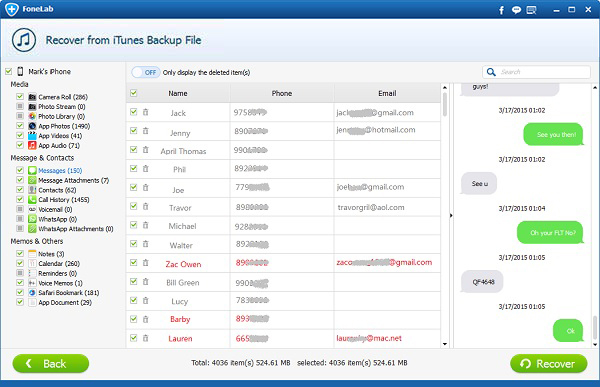 You can easily restore messages, contacts, photos, videos, notes, reminders, calendars, voice memos, voicemails, Whatsapp messages/photos/videos and other data in your iTunes backup file. This recovery software for iOS device allows you to select any data and recover them to your computer easily. 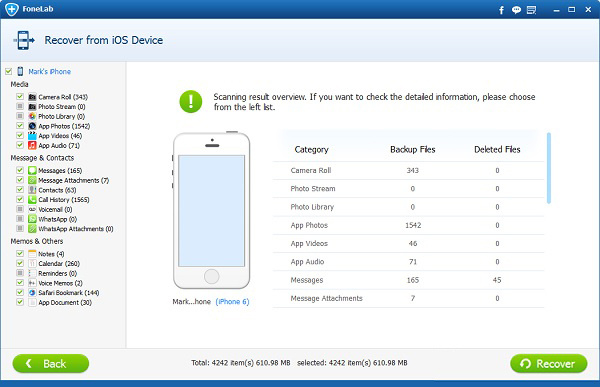 Select the “Recover from iCloud Backup File” option in the main interface of this iOS Data Recovery. You are allowed to log in your iCloud account on the interface. 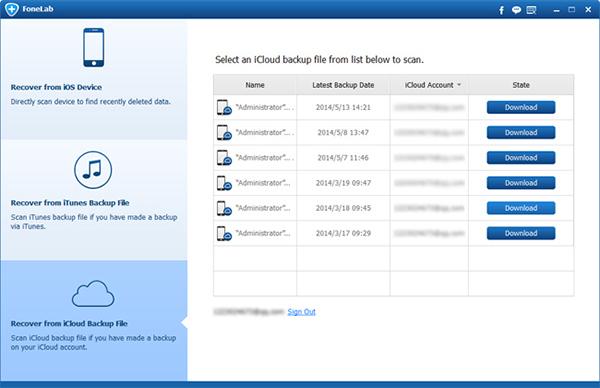 After entering your iCloud account, you will find all the iCloud backup files in your account. Select the backup file you want to recover data from and click “Download” button. 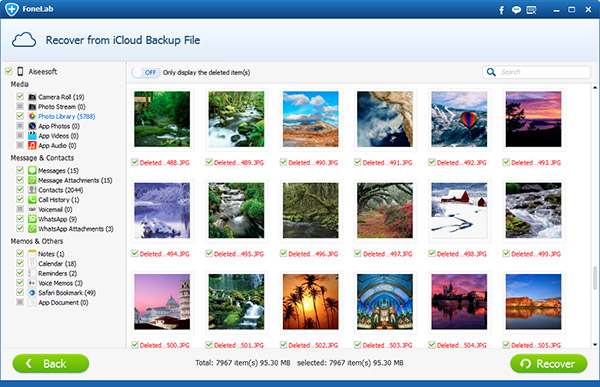 The software will automatically download and scan your iCloud backup file as soon as possible. You can easily find all the data in your iCloud backup file from the data menu on the interface. Enter one category and select the data you want to recover, then click “Recover” button. All the selected data will be recovered from iCloud backup file to computer. Before recovering, you can even preview the data on the interface. You can restore messages, contacts, photos, videos, call history, notes, reminders, calendars, voice memos, voicemails, Whatsapp messages and other data from your iCloud backup file for your iOS device. That’s all for recovering data from iOS devices. You can use this iOS Data Recovery software to recover data from iOS easily. It’s the best data recovery for iOS devices on the market now.